Communication is key, during the breaks we have between these meetings talk to others about projects, work on things etc. etc. Since the Forest of Magic terraforming is basically done. I think it's safe to port in buildings that is located in the forest of magic. However that is for the Forest of Magic only. Pro-tip for terraforming so you're not suffering. Just terraform the area around the place you're porting in. Saves more time, saves more lives. It was a lit 5 person building meeting. We looked at the new additions to the Makai Project. There is now a concept of the Ruins of Vina and some trees added for that area. We discussed the size for Makai. Right now it seems like it'll be around 2000x1320 blocks. Katrix clarified that Heaven can be built on flat terrain and can be ported over when we actually have the floating islands made. NEXT BUILDING MEETING: April 21st, 2018 4PM EST. BUILDING MEETING TOMORROW: April 21st, 2018 4PM EST. We started off by looking at the changes made to the SDM that Yuki did. She worked on the library and the balcony area. This was a nice addition but the SDM is still a W.I.P so the changes that were made are will not be official. She also made a roof for it but it's a bit too eastern for the SDM. We visited the Makai City prototype me and TR worked on. I don't know what color palette to used for it so I asked for suggestions, a more stone look was suggested. The Makai city will be based off of Italian Villas. We talked about Heaven a bit more about the building style of it. It seems it will be a normal Japanese building style. We have made quite a bit of progress on Gensokyo to the point we can make a teaser. If there's an area you have worked on that can be used in a video or a picture. Comment below so Katrix can add it to the list! NEXT BUILDING MEETING: May 5th, 2018 4PM EST. BUILDING MEETING TOMORROW: May 5th, 2018 4PM EST. We started off by looking at the concept of Heaven Birb worked on. She made a layout for the desire land. We looked at it and the signs accompanying it while trying our best to understand with Birb being dead. We then visited the the SDM. The SDM has gained lots of progress. It now has a roof and exterior. It's not finished yet but it's much better than what it was. A copy of the SDM was moved to a remote location because I wanted to remove most of the interior since it was making work for the exterior too difficult. Work is being done there as of right now because I wanted to keep the original safe. Again we are preparing to make a teaser for Gensokyo. Click this link for more information. NEXT BUILDING MEETING: May 19th, 2018 4PM EST. Last edited by KokoButtz; 05-18-2018, 09:26 AM. BUILDING MEETING TOMORROW: May 19th, 2018 4PM EST. We started off with looking at Phantom's Ancient City. We decided that the walls of the cave still felt a bit too spherical and could do with a bit more jagged look. To make what we did easier to understand I made this layout of what was done so far. A. An open wall/hallway thing, occasionally has a wall separating it from the main hallway. Has a sitting area, maybe a couple of paintings. Leads into the Dining Hall. B. I noticed the last SDM didn't have a dining hall/room, it only has a ballroom with multiple tables that felt too much like a cafeteria. Has another door that leads out to the main hall. Leads into the Kitchen. C. A parlor room but it doesn't have a main theme to it. 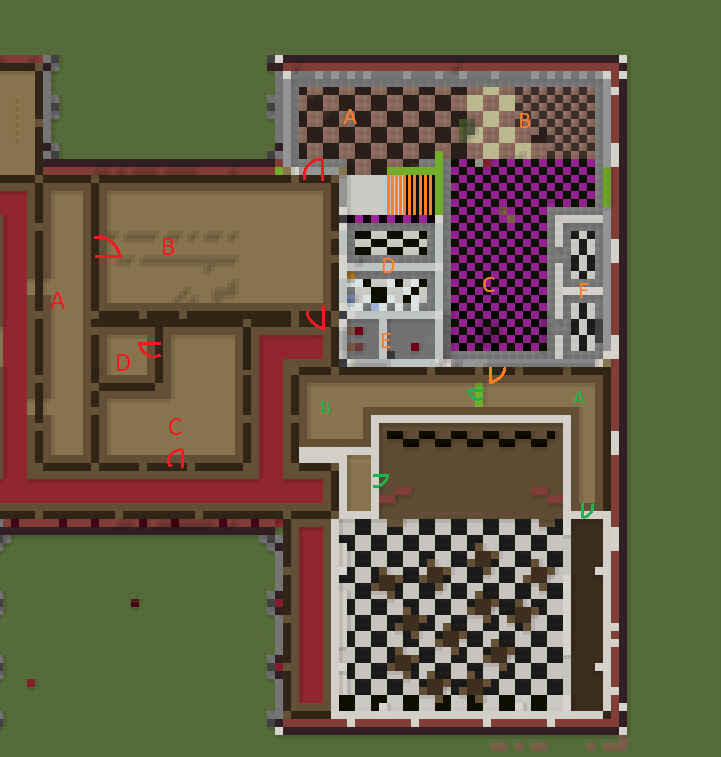 Has a room inside that leads to a W.C.
D. W.C. (aka a bathroom but without a bath) The last SDM only had one W.C./Bathroom it was decided this one would have more W.C./Bathrooms. Kitchen was split into open rooms/sections. Since it's very big and we noticed that other old buildings designed similar to this had them. These are the plans so far but can be changed in the future. The kitchen leads to a hallway that leads into the Ballroom. B. Main cooking area, stoves, ovens, etc. C. Food Prep area, countertops, cutting boards etc. Stairs. This leads into the kitchen part of the basement. A. Hallway that leads into the kitchen, Ballroom, and dressing room. B. Dressing room for the stage. Has stairs that lead onto the Stage. We also started some things for the West wing. But as of right now we're focusing on the East Wing. Hi! We're preparing to make a teaser for Gensokyo! Click this link for more information! NEXT BUILDING MEETING: June 2nd, 2018 4PM EST. Last edited by KokoButtz; 05-19-2018, 11:06 PM. BUILDING MEETING TOMORROW: June 2nd, 2018 4PM EST. Oh yeah, I'll be gone for tomorrow's building meeting. We have had 29 building meetings so far so hopefully you can manage without me. Be sure to include a summary of what was discussed! Since the Forest of Magic terraforming is basically done, Koko thinks it's safe to port in buildings that are located in it. The meeting started at 4:11 PM EST at the Temporary Scarlet Devil Mansion, purpleFinatic and Miraito guided the meeting on a tour through the newly furbished parlor room and dining hall, as well as little details about both of these rooms that were adressed, some of these were the tiling of the bathrooms, the connections to other rooms of the manor and the floorplan for the free space of the Manor's Kitchen. After the tour Karuiko pointed out the issue corresponding the entrance to Voile, the Magic Library, either it being via a staircase or a grand door, this led to a debate concluding that both options were optimal, but further debate was necessary to include the circumventions of the missing appendages of the manor, primarily, its basement into the different connection systems of the house. The group continued its trip to the Temporary Chireiden Warp where Eiburine and purpleFinatic showed progress on the Palace of the Earth Spirits, mostly the floorplan and conceeptions of the project, as well as the way of accessing the Old Hell of Blazing Fire, that considers a crater leading down into the core of the world. The group later on moved to the Lunar Capital Temporary Warp in order to address the different building fixtures and details that required attendance for the Trailer of the Gensokyo Project, going for a more chinese approach to the decorations of the Halls of Amaterasu and Tsukuyomi. Later on, Nicolas_Akushi showed the miniature model of the entire moon project and the different stages of the build itself, as well as a concept for the Lunar City architecture, where more futuristic vibes bloom, this to complement the references in Silent Sinner in Blue as well as Perfect Memento in Strict Sense. For a final note on the Meeting's topic, Katrix and Nick addressed one of the most important issues of the project: Size. After a discussion on scale and perspective the rough size of the Lunar Capital with its city, was defined to 800x800 blocks. 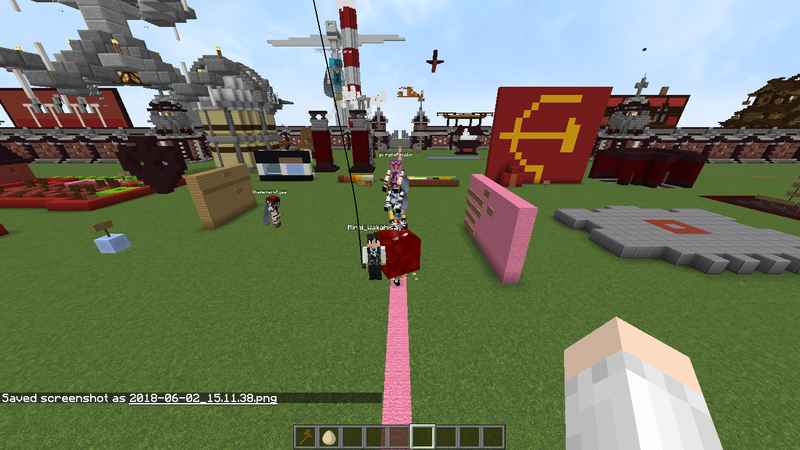 With this the 30th build meeting of the Yukkuricraft Server on the Gensokyo Project is concluded at 5:16 PM. As a side note, we are preparing a teaser trailer for the Project itself. Be sure to check it out by clicking on this link for further information. Last edited by nickmaster00; 06-03-2018, 11:33 AM. BUILDING MEETING TOMORROW: June 16th, 2018 4PM EST. In this building meeting there wasn't any new additions or any new builds. So I decided that this building meeting would be a different one where we actually build. I guess in cases where we don't have anything to show we can dedicate the meeting to actually working on Gensokyo until we get tired! NEXT BUILDING MEETING: July 7th, 2018 4PM EST. BUILDING MEETING TOMORROW: July 7th, 2018 4PM EST. I will be dead for who knows how long so ya boi Nick will be hosting again. If Nick isn't able to host some days I hope you all continue to do building meetings, again if there isn't anything to show then just work on Gensokyo stuff for like 2 hours. This is late bc the kiddos forgot to make a summary. The squad started off talking about the location of the gappy club. After that they talked about SDM and then proceeded to work on the SDM. NEXT BUILDING MEETING: July 21st, 2018 4PM EST. Together we tackled the SDM, finally progressing to the 3rd floor and attic areas! Nick is looking for people to help him interior decorate the Lunar Capital.